One recent Saturday morning we were a bit stumped for things to do as it was peeing down with rain outside, so I noticed we had two juice bottles in our recycling and I thought surely we could make something out of these? 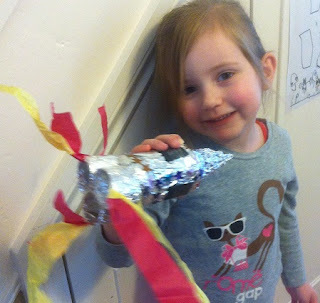 We’d been watching an episode of Ben and Holly when they go into space so I thought why not make model rockets from them? It seemed like a fairly easy idea in my head and actually in practice it was too. The kids had a lot of fun helping with this as it really is very simple. 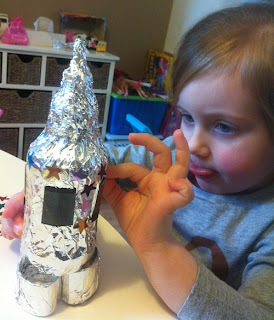 So here’s our crafty instructions on how to make a rocket…..
3 – Stick the 3 covered toilet roll pieces to the bottom of your covered bottle using sticky tape– these are your rocket exhausts! 5 – Finally tear some strips of bright orange/ yellow/ red tissue paper and stick to the rocket exhausts for flames - there you have a a really speedy to make rocket! 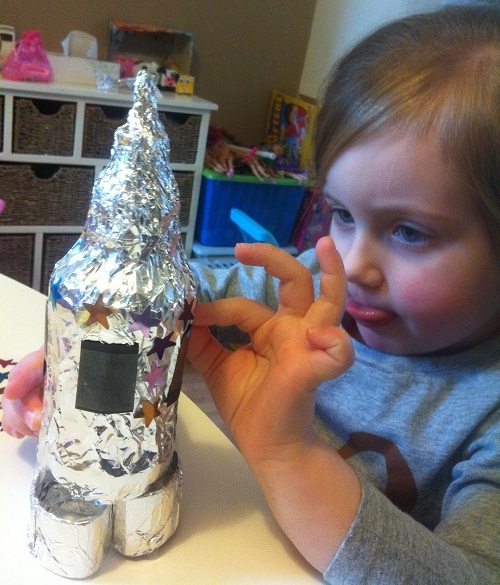 Making the rockets was a lot of fun and then playing with the rockets after was also a big hit! Amazing that you did that with things you find around the house! It is, indeed, crafty!